← Networking Is Not Asking for a Favor! Last week, I had a fascinating conversation with a professor who shared her experience as a junior faculty member. She was a bit of hot shot, getting accepted at some of the best conferences in her field. Her assigned “mentor” told her that it would be more appropriate to be at regional conferences recruiting for their program. Only in hindsight was it clear that the ‘mentor’ was giving bad advice because of petty jealousy in a competitive environment in which mentors don’t want their protegees to outshine them. This junior faculty member survived and is thriving still! Why isn’t publishing part of the PhD program? Is it because faculty egos couldn’t handle having their students publish in the same venues they’re competing to publish in? Why can’t you get the following information from a simple Google search: the quantity and kinds of publishing you must complete in order to get tenure? Why is it so hard to get good mentoring as a junior faculty member? And why is inverse mentoring in which your assigned mentor ultimately tries to bring you down tolerated? And when it comes to publishing, reviewers have some of the same issues that mentors and departments seem to have. Though there it’s usually reviewers trying to guess who is writing the article they’re blind reviewing (or whose student is writing it) and making decisions based on petty jealousies and competitions in that realm. Editors, in the end, need to get articles in their issues so they’re the ones to please! Someone who is going to help you establish realistic goals. 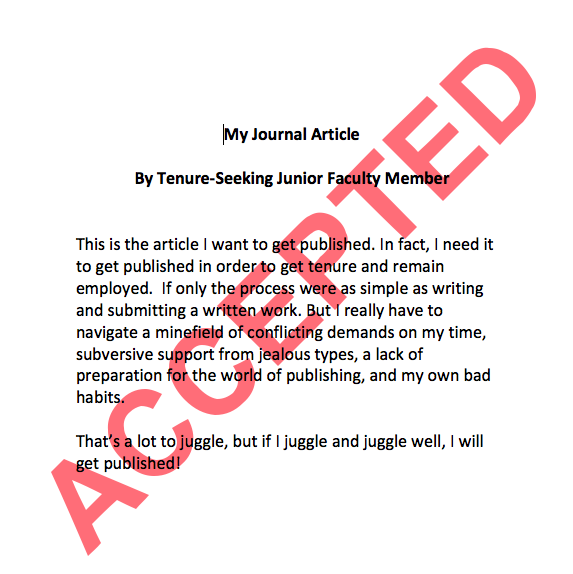 You need help identifying the kind of journals that you can get published in and earn tenure with. It can’t be so easy that it winds up not counting for tenure. It can’t be so hard that you’re constantly getting rejected. A straight talker. You need to know exactly what you have to do to earn tenure. That’s not written down in many places. Most departments are not transparent about the details. Find someone you trust to tell you what kind of publications you need. Do co-authored pieces count? Do book chapters count? If so, how much? Then cross check the information you get from this trustworthy individual with others in the department. Jealousy. This can be the petty type described above, but it can also be more innocent–truly friendly colleagues who are not consciously undermining you at all, but whose own struggles with the academic publishing process come through in their advice and support for you. Avoid the overtly petty jealous types. And stick to your own ambitions when it comes to the true supporters who struggle with their own journey down academe’s path. Unrealistic understanding of the process. This is where you are your own worst enemy. You have to completely understand and embrace the time it takes to produce academic publications. This is twofold: how long does it take you to prepare an article for submission–really? And how long does it take from submission to publication? The answer to both is a long time–longer than you think so it’s important to wrap your head around that early in the game. Once you are actively writing, you must embrace the importance of really spelling out the connections between your work and what the journal describes as the work they publish so you’re not wasting your time submitting work that simply doesn’t match the venue. Similarly, you have to be prepared for the reality of revise & resubmit. “Revise & resubmit” is wonderful news! It’s like an accept! But you have to be willing to do the revisions–and you have to include that in your realistic understanding of the process. Know when you initially submit that it is a draft that you will inevitably have to edit. None of this is easy, but being conscious of it and working to actively manage it will keep things from slipping away and out of your control.